Forget big box electronic stores – your next great wireless accessory could come from Ikea, instead. 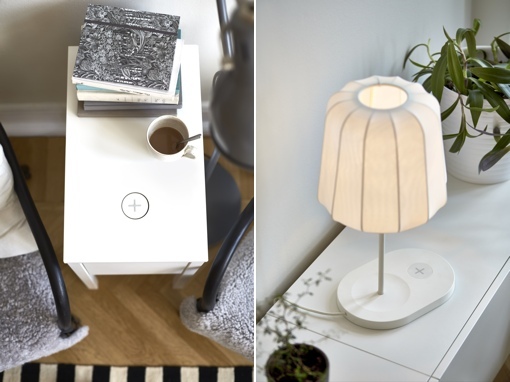 The Swedish furniture giant has announced the launch of a new design collection that integrates Qi wireless phone charging capability into bedside tables, lamps, desks and other furniture items. Expect the tech to arrive on store shelves here in the U.S. and Europe sometime in April 2015. “Through research and home visits, we know that people hate cable mess. They worry about not finding the charger and running out of power. Our new innovative solutions, which integrate wireless charging into home furnishings, will make life at home simpler”, states Jeanette Skjelmose, Ikea Business Area Manager Lighting and Wireless Charging. Wireless charging technology, like power mats, has been available to consumers for years now. But despite ample marketing efforts – Starbucks announced last year that it was building Powermat wireless charging stations into stores nationwide – the tech has yet to truly take off. A big part of the issue is the fact that there are competing standards, Powermat and Qi, which are generally not compatible with each other. The good news for Ikea shoppers here is that many big-name Android device manufacturers have already built Qi technology into their phone. The Google Nexus 5 and Nexus 6 both feature Qi; the coming Samsung Galaxy S6 and Galaxy S6 Edge phones feature both Powermat and Qi wireless charging. There’s no built-in wireless charging technology in the popular Apple iPhone 6, but it can be added on via accessories available at the Apple Store. Ikea’s new Qi-enabled furniture line will be available in stores, by catalog and online at ikea.com. You can download the Ikea app on Android (via Google Play) and for iOS (via iTunes).